The names Siddique & Lal, Dileep, Madona Sebastian, that is enough to await for this movie eagerly. The biggie comedy masters of Malayalam Siddique & Lal ,their reunion was something that we all were anxiously waiting for all these years. But it took twenty-two years for one of the best and top directorial duo from Mollywood to come back and join together for another film. The talented and successful directors who were instrumental in some evergreen blockbusters like Godfather, In Harihar Nagar and Ramjirao Speaking to name a few return together (not completely but only partially) for King Liar. Lal direct Dileep in King Liar that has story by Siddique and screenplay written jointly by Siddique and Lal. And about the film, half of the film is a clean entertainer with lot of funny moments created by Dileep-Balu pairing which was being tried for the first time. The other half narrated in the backdrop of a fashion world has little humour compared to the first half and is having a more serious tone in it. So King Liar is an entertainer that is watchable for its comedy part. The first half was extremely good with the non-stop comedy, but in second half, it was quite predictable in terms of the ending and storyline. The story revolves around Sathyanarayanan who is a master in telling lies and fooling people. Someone notice this ability in him and assign him a job which is what is seen in the remaining portion of the film. Screenplay was packaged nicely focusing primarily on the comic timing of Dileep, his peculiar mannerisms and dialogue delivery. Balu makes the funny side looked complete. The romantic side of the story narrated with a pinch of humour in it looked less convincing. The role and mannerisms of Sathyanarayanan is something that puts Dileep in his comfort zone and he was in his elements with his humorous act. After the blockbuster Premam, Madonna Sebastian playing the character of Anjali and the love interest of our protagonist was comfortable in that character and at the same time looked beautiful on screen. Balu perhaps is casted for the first time as a combination with Dileep and it was a good choice as their combination scenes evoked good dose of comedy. Lal who had a major part to play in the second half appearing as Anand Varma, the fashion tycoon was suited for that role had a good screen presence while Asha Sharath played his wife in a glamorous makeover as Devika. The Siddique-Lal duo has succeeded in making the first have worth watching, with the perfect blend of comical and romantic elements. But the second half enters into a more serious zone, which badly affects the entertainment factor. Bipin Chandran's dialogues are good at the first half, but turns out to be unnatural in the second half and climax portions. King Liar hasn't reached the usual perfection level of Siddique-Lal movies, but it is not a disappointing watch either. Background score is composed by Deepak Dev and it was not a bad effort at all. Alex Paul returns to the music scene after a break and his songs were not commendable but not bad either. Cinematographer Alby scores with the exceptional visualization. Ratheesh Raj's editing is just fine. The makeup department highly disappoints, as most of the actors, especially the leading lady, looks artificial onscreen. Go with zero expectations, then King Liar full fill you with fabulous comedy.The quality of humour from Siddique-Lal had a high standard and is enjoyable even now. 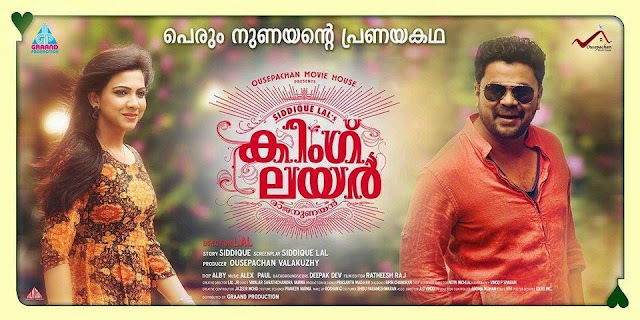 In a word, King Liar as an all round Dileep show is a reasonably good treat for the vacation season.